Michael Pacher was a German painter and sculptor working in the late 15th century. He ran a profitable studio whose active assistants included two of his sons. His style reflects the monumentality and forms characteristic of German artists such as Hans Multscher and Konrad Witz, combined with his knowledge of Italian art, particularly Andrea Mantegna and Filippo Lippi, through which he introduced classical elements. 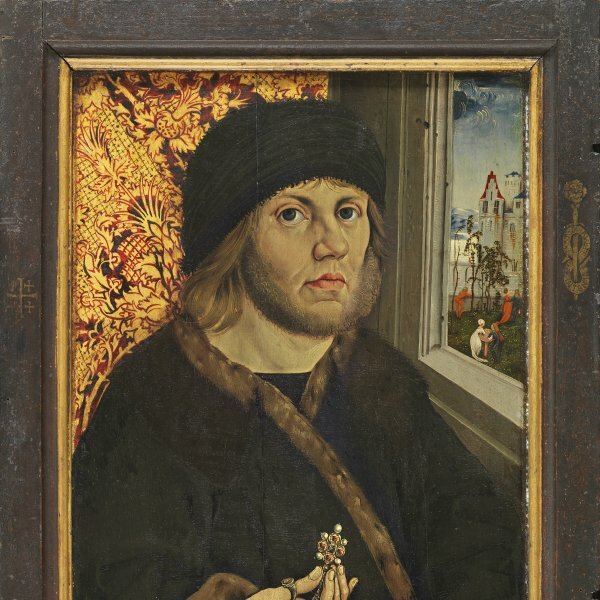 The present panel has been the subject of various opinions regarding both its date and attribution, and Isolde Lübbeke ultimately gave it to a follower of Pacher. The painting was formerly in the Abbey of Saint Peter in Salzburg and is it known that in 1900 it was in use as the central panel of a triptych. It depicts a Sacra conversazione, a theme typical of Italian painting, combined with a Coronation of the Virgin and a Mystic Marriage of Saint Catherine. Both Saint Catherine and Saint Margaret are shown with their typical attributes: the former with her wheel of martyrdom and holding a book, and the latter with the dragon and a cross on which she meditates. The painter and sculptor Michael Pacher was the most important late Gothic, Alpine artist. His studio trained a large number of artists who worked alongside assistants and collaborators, among whom were his sons who continued and developed his style but without the expressive force of their father’s work. Nothing is known of Pacher’s early training, although it has been suggested he was apprenticed in local workshops. His style reveals a knowledge of Italian art, particularly that of north Italy, and of the work of specific artists such as Mantegna and Donatello. Pacher combined their innovations with traditional features of German art. The first concrete reference regarding his activities dates to 1467 when he was living in the city of Bruneck (in the Puster valley) and was head of a workshop. Pacher’s masterpiece is the main altarpiece (1471–81) in the parish church of Saint Wolfgang in Austria, which is still in situ and unaltered. Both the date and the degree of participation of Pacher in the present narrow panel has been the subject of considerable interest to art historians since the first study was published on the painting in 1888. The panel was previously in the Benedictine abbey of Saint Peter in Salzburg where it remained until 1933. It appears that shortly after 1900 this panel was installed as the central element of a triptych whose lateral wings took the form of isolated figures against gold grounds. The inner left wing, from top to bottom, included the figures of Saint Maurice and Saint Thomas, while on the right wing were Saint Erasmus and Saint Odilla. On the exterior, from top to bottom and left to right were Saint Sebastian, a bishop saint, a pope and Saint Roch. These lateral panels were attributed to Marx Reichlich who worked with Pacher. 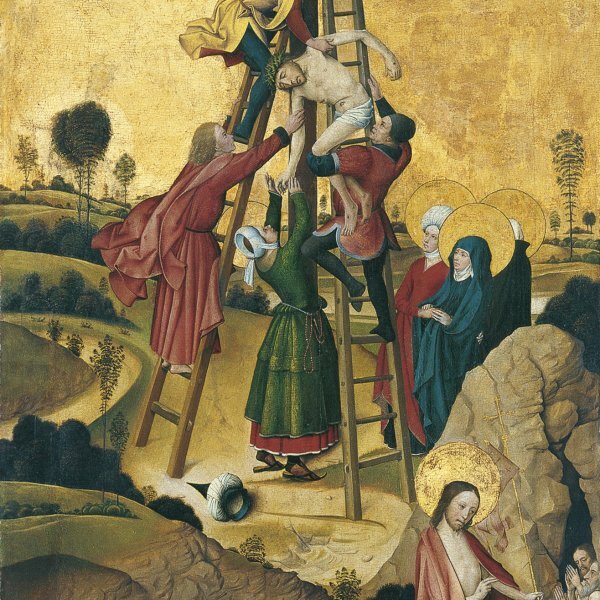 The entire triptych was sold by the monastery in 1933 and dismantled when it appeared on the art market. Four of the paintings are now in the Österreichische Galerie in Vienna and another four in a private Viennese collection. Despite the way in which this panel was installed in the early 20th century, it is not impossible that it was originally the right wing of a larger ensemble or alternatively, that it was an independent composition. The panel depicts a common scene in Italian art: that of a Sacra Conversazione. In addition, on the right next to the Virgin crowned by two angels it includes the episode from the life of Saint Catherine traditionally known as her “Mystic Marriage”. The composition also includes the figure of Saint Margaret on the left, identifiable by the dragon at her feet and her cross on which she meditates. On the right, Saint Catherine holds a book while her martyr’s wheel lies at her feet. The two saints’ ample, sumptuous garments fall in rich folds and fill the lower part of the composition. This panel, which is of notably high quality, has been the subject of an extensive study by Isolde Lübbeke in which the author emphasised a series of aspects that led her to attribute it to a follower of Pacher. They include the treatment of the space, which in autograph works by the artist is more fully developed in relation to the figures with a use of perspective and architectural elements that are not to be found in the present work.